Joy to the world! Milly Johnson has a Christmas book out and it’s a cracker – sorry, couldn’t resist! Much of the book takes place in a Christmas cracker factory run by Annie and her husband Joe. Rather unexpectedly, and to their great delight, she finds herself pregnant for the first time at 48. The local doctor has the idea to have a club for expectant mothers due around Christmas time – the Christmas Pudding Club. I must say I think that sounds like a splendid idea as it can be a worrying time being pregnant. It would be great to have mums-to-be at the same stage to chat with, as well as the kind reassuring midwives we meet in this book. Now, if you have read lots of Milly Johnson’s books you may recognise some of the characters as some have appeared in previous books. This book is a standalone story though so don’t worry – even if it’s your first Milly Johnson book, you’ll keep up no problem. And lucky you, you’ll have lots of her previous books to catch up on! I loved reading this very funny, uplifting book with all the wonderfully drawn characters. The support and friendship between the women was fantastic. There is so much that any woman who has had a child will remember from having their babies from the wonderful, to the worrying, to the funny, to the downright embarrassing! Milly Johnson has a real talent for creating characters who feel like totally authentic people you could meet when you pop out to the shops. She creates scenes and situations you can identify with or easily imagine if you haven’t experienced, and makes you think how you would respond if you were in her characters’ shoes. The book is thought provoking as well though making you consider more serious issues such as organ donation and how that can make a difference not just to the recipient but can also bring some comfort to the donor’s family. Social issues are also explored though another character who is making a difference in the lives of young people in his community, having come from a difficult background himself but given the opportunity to better himself. I can’t finish this review without mentioning the snippets from the local paper, The Daily Trumpet. The corrections and apologies included were hilarious with even some of the corrections having glaring errors. I’m surprised the paper had any money left with everything they kept paying out by way of apology! 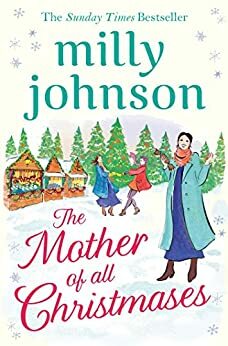 The Mother of All Christmases is a fabulous, feel-good festive read and I loved spending time with The Christmas Pudding Club. I’ll remember these characters for a long time. Although not really a part of the book, I have to say that the cracker jokes at the end are some of the best I’ve seen. I won’t spoil them all but just had to share this one: Where’s the most fun place in the Universe? The Milky Way-hey! Milly Johnson was born, raised and still lives in Barnsley, South Yorkshire. As well as being an author of 13 published novels, 2 short story books and 2 novellas, she is also a copywriter for the greetings card industry, a joke-writer, a columnist, after dinner speaker, poet, BBC newspaper reviewer, and a sometimes BBC radio presenter. She won the RoNA for Best Romantic Comedy Novel of 2014 and 2016 and the Yorkshire Society award for Arts and Culture 2015. She writes about love, life, friendships and that little bit of the magic that sometimes crops up in real life. She likes owls, cats, meringues, handbags and literary gifts – but hates marzipan. She is very short. Milly’s website is http://www.millyjohnson.co.uk. She is on Twitter @millyjohnson and has a Facebook page (just google Book Page of Milly Johnson). She also has a monthly newsletter http://www.millyjohnson.co.uk/newsletter with exclusive, news, offers and competitions. So looking forward to this one and meeting up with Milly again at our literary festival in May. Great review – sounds really good! Sx. Excellent review, bumping this up to top of the Christmas list! !